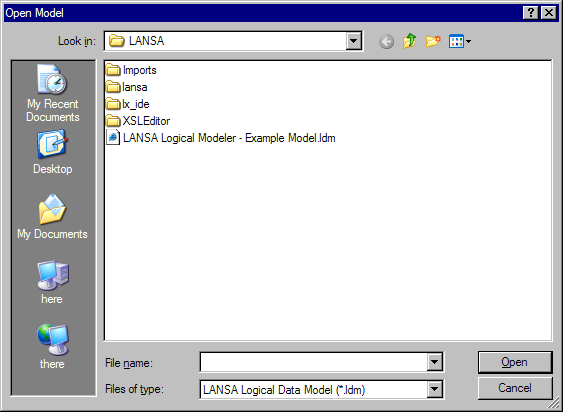 By default, LANSA models are stored in the LANSA directory of your LANSA installation. Any models which exist in this directory will be displayed in the Open Model list. In addition, the last nine models that have been opened appear in the File menu. To re-open one of these models, simply select the corresponding menu option. Once the model has loaded, it will be shown in the main diagram. The model view settings are remembered from when the model was saved. Note that the model is saved as an XML file and as a Visio document. If any errors are found in the model's XML, it will not load and a message explaining the error will be displayed. This should only occur if you have manually altered the XML and used invalid syntax or have manually removed shapes from the Model Visio document. It is strongly recommended that you do not manually alter model XML.